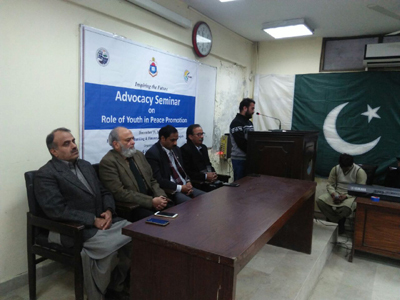 LAHORE: (Tuesday, December 18, 2017): This was stated by the speakers in the seminar on “Role of Youth in Peace Promotion” conducted by the students of Hailey College of Banking and Finance, University of the Punjab under the aegis of Center for Health and Gender Equality on December 19. 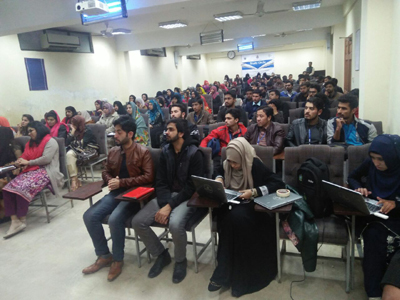 The seminar was addressed by Salman Abid, Regional Head SPO, Popular Political Analyst, Azam Malik, Motivational Trainer and Famous Punjabi Poet, and Prof Dr Fida Hussain Bukhari, Vice Principal Hailey College of Banking and Finance (HCBF), Mumtaz Hussain, Executive Director Center for Health and Gender Equality (CHANGE) and students. It was attended by the teachers, students, and representatives from Civil Society Organizations. 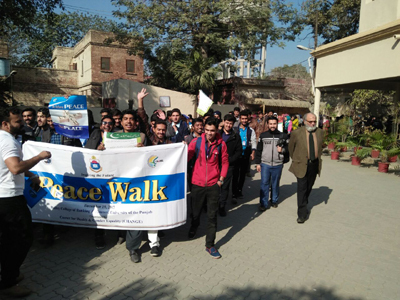 On this occasion the students conducted different activities to translate the message of peace among their fellow including a Peace Walk and Signature Campaign. 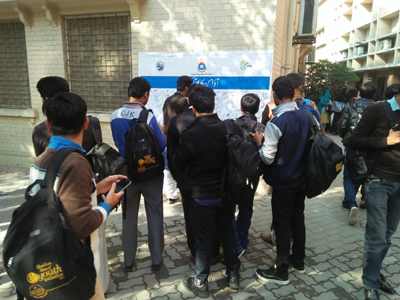 Number of students signed the campaign inscribing the pledge for peace promotion. While addressing the seminar students through their speeches highlighted the role of youth in peace promotion and how important it is for the development of the country. He further emphasized on the productive use of social media as it is the most influential platform to reach wider audience. “Social Media is the Platform through which we could change the perception that rest of the world has for us and this could be only done by this youth” he added. Whereas Azam Malik, famous Punjabi Poet, highlighted the role of Sufia-e-Karam and linked their messages with our youth and explained how deep meaning that have. In the concluding remarks Prof Dr Fida Hussain Bukhari, Vice Principal, HCBF, lauded the efforts of students and appreciated the steps taken up for engaging youth in positive activities.